As the questionnaire for our study of Rural Medical Practitioners ("quacks") and other Private-Sector health care agents in Bihar has been taking shape, we needed an opportunity to get out to one of the districts here that has a very high incidence of Kala-azar. Our last field visit (in Patna District) was extremely informative, but it gave us the perspective of health care workers that operate in an area where KA is not a significant burden. 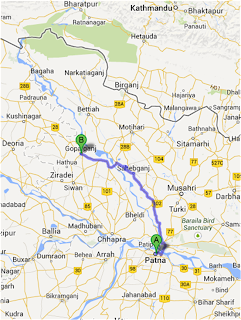 This time, Clara, Ishani and I headed northwest of Patna, to Gopalganj, which has many hundreds of KA cases every year. 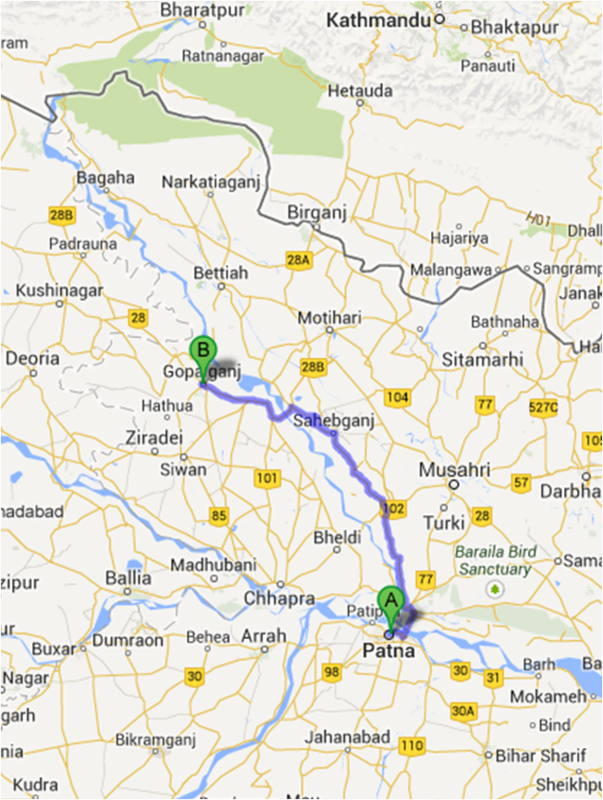 We left about 7AM, crossing the wide Ganges river as we left the city, and arrived in Gopalganj district before noon - occasional heavy traffic and some stretches of really rough road slowed us down. When we arrived, we met up with Atul, the local CARE Link Worker, who escorted us around the villages in his territory within Gopalganj. We started at the Manjha Block Primary Health Care Centre, a public facility that deals with many more cases of Kala-azar each year than the centres we visited in Patna last month. And though our research study is really about the private sector, we need to understand how the quacks and the private doctors fit in the patient's journey (which often also includes the PHC), so we wanted to have the perspective of the public health centre doctors as well. A Block is an administrative region within a District, containing multiple villages (so it goes village->block->district->state->country). Manjha Block contains about 100 villages, with just shy of 200,000 inhabitants. Like all PHCs, Manjha's deals with Maternal and Child Healthcare (it is staffed with two Auxiliary Nurse-Midwives, or ANMs), but also has several doctors, a Block Health Manager, and its Medical Officer-In-Charge, Dr. Singh, with whom we spoke. We were interested in finding out how many cases of Kala-azar they see in this Block, and we were told they had had 87 in 2012, but only 20 so far this year. They attributed the decline to an effective campaign of Indoor Residual Spraying (IRS). Dr. Singh said that every house in every village had been sprayed last year (though we found some evidence to the contrary later). As I've mentioned before, IRS is comprised of teams of two sprayers with (usually) hand-pumps, spraying DDT on all the surfaces within each home, up to 6 feet off the ground. As there are probably 40,000-50,000 homes in this block alone, you can imagine that it's a costly and time-consuming event, especially considering they do it twice each year! But this is the most effective way to reduce the sandfly population, which helps reduce the incidence of Kala-azar significantly. Unfortunately, we discovered, spraying in Manjha has not yet happened in 2013, as the spray workers were on strike, hoping to become permanent government employees instead of temporary contractors. Hopefully this won't mean a big uptick in KA cases next year. Dr. Singh explained that for PHCs, the government provides one of the newer KA medicines, miltefosine, to give to KA patients for free. Miltefosine is supposed to be given for 28 days, and he believed that most patients stuck to the regimen and completed the full course. 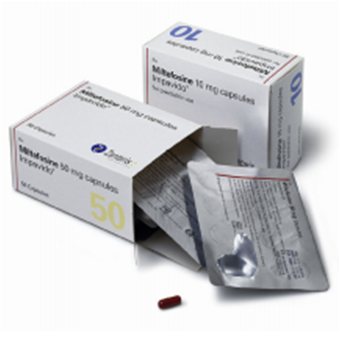 Miltefosine takes some of the strain off of the crowded PHCs, as it is an oral drug; this allows KA patients to be outpatients instead of taking up valuable bed space in this small facility. He also mentioned that miltefosine was used to treat PKDL patients - as previously described, PKDL (Post-Kala-azar Dermal Leishmaniasis) is an otherwise harmless infection of the skin by the Leishmania parasites after an apparent cure of KA...but those with PKDL serve as a reservoir for the protozoans, and keep the disease cycle going. Thus, curing these patients where they're found helps control the disease. It was good to hear that these patients were being identified and referred to the PHC - in this case, by the CARE Link Workers and the ASHAs. ASHAs - Accredited Social Health Activists - are the front-line health care workers in rural India. They are all literate local women who report through the block's ANMs. As the government creates one ASHA position per 1000 population, there are about 200 ASHAs in Manjha Block. Taking our leave of Dr. Singh and the PHC, we went to meet a group of ASHAs who were getting together for a training discussion at a nearby high school. While the ASHAs' primary function is to attend to the needs of mothers and young children in the villages, they receive training to help manage most public health issues, including infectious diseases like TB, malaria, and Kala-azar. For KA, they are trained to identify the early signs of the onset of the disease (two weeks+ with fever that doesn't respond to medicine, tender abdomen with enlarged spleen) and get the patients quickly to the PHC for treatment. Along with finding KA patients, the ASHAs also spend time in dispelling some of the myths about the disease, and teaching villagers about how it is transmitted. They are also critical on-the-ground help when the government holds a "Kala-azar camp," shepherding ill villagers to the camps to get tested for KA and treated if positive. Another key role they play is preparing the village for IRS, helping the inhabitants to understand why the spraying must occur and explaining how to prepare their homes. This requires moving many of their belongings out of the house to enable full coverage of the spray, and making sure that food items are fully covered so that they are not contaminated with the DDT. As I mentioned in my post about the tola we visited in Patna district, sometimes villagers go along behind the spray workers and plaster over the DDT, completely negating its effect! The ASHAs teach the homeowners not to do this. Villagers sometimes doubt that the spraying helps - after all, it's hard to see the sandflies to begin with, as they are quite small and hide during the day. ASHAs do their best to assure people that it does indeed make a huge difference. They told us that people's trust in them has been growing, and they are viewed as important members of the community now. Importantly, the ASHAs told us that it was inevitable that villagers would visit Rural private providers (quacks), as many had the attitude that "anything free can't be good." But they were working to try to ensure people took their health seriously and to try to get people to trust the government facilities. We attracted the usual crowd! Thanking the ASHAs for their time, we next went to a tola to see some of the people they help. Atul told us that this tola, Dhai, was home to a lot of current and past Kala-azar patients - and he sure was right. The villagers told us that almost every home in the tola had at least one KA patient, over 60 in all. This tola was not subject to the same abject poverty as the community of Musahars we had visited on our last field trip, but still lived with a mix of concrete, brick, and straw-and-mud homes, with livestock living in and around their homes - so still a great environment for sandflies. We first spoke with one patient, Raju, who was currently receiving injections of the old (and now at times ineffective) cure for KA, Sodium Stibogluconate (SSG). SSG is an antimony-based drug, which can be a bit tough for patients to tolerate. But we were especially interested in why Raju was getting these injections instead of taking the pills - especially since the SSG was expensive (about $50 - a huge sum here) while the miltefosine is free! Raju explained that he had indeed gone to the PHC (after a few days of ineffective treatment by a quack) and received his miltefosine - but he had started vomiting from the capsules within two days, and stopped taking it. He then went to a private doctor and received the prescription for SSG, which was being administered every other day by a local compounder (medicine mixer). This was the first we had heard of serious side effects leading to discontinuation of miltefosine. But Raju wasn't the only one in Dhai Tola who had experienced it - quite a few of the villagers had gone the same route. We saw the records and prescriptions for each of the villagers, and noticed that they all had visited the same Private doctor, located about 6 or 7 km from the village. Raju related that this doctor had said that miltefosine was not effective (which is completely counter to all the evidence we'd seen - though this may be a bit of a miscommunication on the villagers' part - he might have been referring to tolerability, not efficacy, issues), and that they should take SSG instead. We then started looking at the other villagers, and noticed that at least a couple of them were showing signs of PKDL - which often shows up as bumps or spots on the face or arms. One adorable little girl, named Soni, clearly had PKDL, with typical bumps covering her face. PKDL isn't painful or distressing in any way other than aesthetically, so those afflicted often don't bother seeking medical help for it - the exception usually being young women worried about their marriage prospects. A full course of treatment usually clears up the spots - but of course more importantly eliminates a reservoir for the parasites. Soni had had Kala-Azar a couple of years ago, and like Raju was prescribed miltefosine at the PHC...but vomited from the medicine. She had been taken back to the PHC to get anti-nausea medicine, but her mother told us that it didn't work, so she ended up getting SSG as well. This past week at a government conference, we had heard some evidence that those treated with SSG were more likely to develop PKDL after their apparent cure, and that seems to be bearing true here in Dhai. Several others seemed to have PKDL, including Soni's mother.We explained that the PHC could help them get treated. Now, if you'll remember, the Manjha PHC doctor had told us that all the villages in the area had been thoroughly sprayed. It turns out that this tola hadn't seen any spray crews for five years! This helps explain the high prevalence of KA in this community. And with so many paying for SSG and visits to the private doctor, it is taking a bit of an economic toll as well. One patient told us that he had to rent out a piece of land to pay for treatment. We walked through the tola and met a few other patients, including one woman who was still feeling quite ill, and a young lady, 15 or 16, who was just finishing up her miltefosine treatment. She had been started on a heavy dose, but after vomiting apparently had gone back to the PHC and received a lower dose, which she managed tolerate. Intrigued by the situation in this tola, we decided to visit the private doctor that the tola residents had been seeing. The doctor there mentioned that he was usually seeing 10-15 patients per month. He believed that there was a lot of cases similar to Raju's and the others we'd spoken with in the tola - where they were not able to tolerate miltefosine and had to be switched to SSG. He was aware of amphotericin B, which is available in some of the District- and State-level hospitals, but it was not available locally. He was aware of some of the local quacks, who likely referred patients directly to him. And he mentioned that he sometimes referred difficult KA cases to the Patna Medical College Hospital that we visited on our last field visit. He also said that he wasn't currently reporting KA patients to the local PHC - something that CARE hopes to enable to do through a comprehensive information system that they are currently piloting. It is important to track patients to ensure the government and the development community can identify KA hotspots, provide help where it is most needed, and measure progress against the goal of eliminating the disease. He said that he did indeed use local boots-on-the-ground (like the compounder Raju had mentioned) to administer the SSG injections if the patient could not easily get to his office. Another set of private providers that we hadn't considered!